Places can now be performed safely and easily. The flowmeter includes a thickness measurement function and can effectively measure the sound velocity of fluids. Measurement data can be printed, logged or transferred to a computer which can assist data collection and analysis. Energy flow rate measurements with Pt100 RTD option. Visual confirmation that receiving echo is “good”. 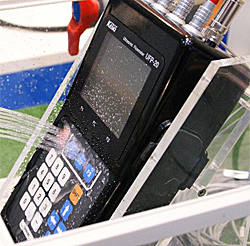 IP65 rating maintained even during measurement. Logged data and site conditions can be storaged into internal memory. English, French, German, Italian,Japanese, Portuguese, Russian, Spanish, and Turkish.